My daughters wrestle with my son. They tickle him and bounce him down on the bed. They invent games, make-up reasons to chase him. He, in turn, grabs the light sabers and initiates a duel. They squeal through the house. Mom calls the girls to homework time, or reading time, or piano time, or some such other responsible nonsense. My son’s answer to the abandonment by his favorite playmates? Climb all over them on the piano bench. Pull at their pencil-holding arm while they try to fill in the homework worksheet. Yank them up out of the sofa and demand that they chase him again. These are the nicknames my son has bestowed on my girls. Toria (Victoria), Wauren (Lauren), and Tat-Tat (Catherine). He calls for them all day long. He summons them for playtime through the afternoon and evening. He cries for them when they climb onto the bus and when they head off to bed for the night. I love in the book of Ruth how Naomi asks her daughter-in-law about the first day of gleaning in the fields. Ruth probably came home tired after the day of working. Yet, her arms were full of her day’s pickings. She must have been rejoicing, thankful, excited! After all, gleaning could be risky for a young woman on her own. Who knows where you could end up: a field with a dishonest farmer or, even worse, one with a lusty field hand. But Ruth returns home safe and returns home with abundance. So, Naomi asks, “Where did you glean today? And where have you worked?” (Ruth 2:19 ESV). Ruth knows the real answer isn’t about the where. She doesn’t launch into geographical descriptions or give the name of the farm. Instead of answering Where, Ruth tells Who: “The man’s name with whom I worked today is Boaz” (Ruth 2:19 ESV). “Isn’t the who always so much more significant than the endless how’s, what’s and why’s we endless fret over? I tend to toil over details, trying to figure out how things are going to work out, where help is going to come from. It is then that I am most in need of Jesus…”(Ruth). Surely we should know the same. I fail at this so often. My kids had to ride the bus home from school, something they hadn’t done in four years. I’ve been picking them up all this time. So, I fretted over that change in the routine all that day. I prayed about it and asked others to pray about it. I watched the clock and distracted myself with activity, anything to keep my mind off what might happen if things went wrong. My faithful God, the God who loves me and loves my children more than I ever could, can care for them. I need to trust Him to hold them in His own hands and stop freaking out over the tiniest details as if I’m the one who is really in charge here. Maybe this is the hardest thing, for a mom to entrust her babies to God. I want to hover, want to protect, want to plan out every detail and avoid every hurt or disappointment. I want to combat every bully and avoid every bad influence. I want to control the conversations on the playground and every detail of their day. But I need to trust my Who. 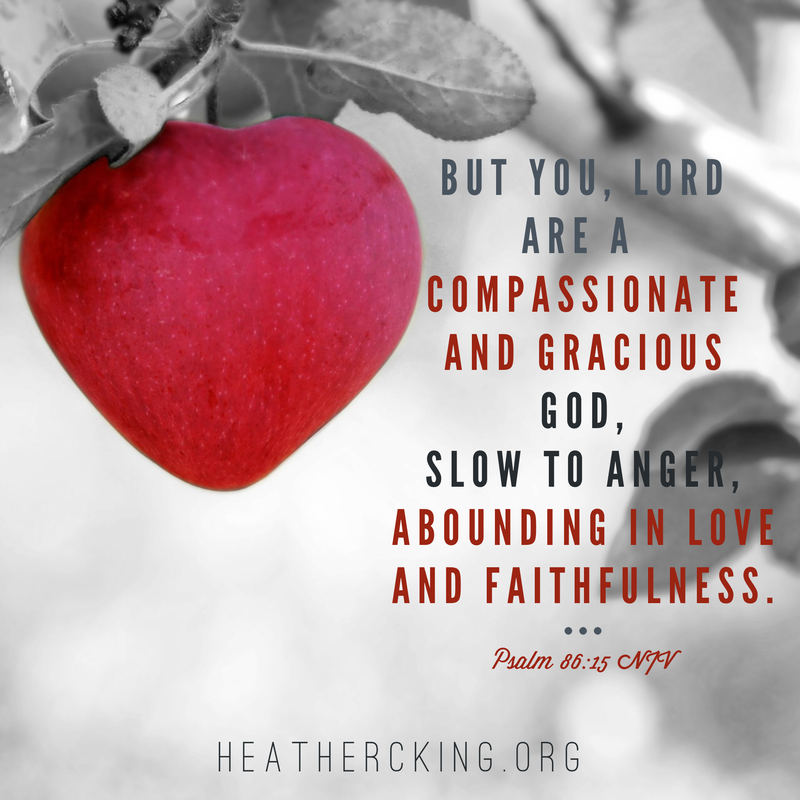 slow to anger and abounding in steadfast love and faithfulness (Psalm 86:15 ESV). We can worry over countless details every day. Where are you going to find safety and provision? How is this all going to work out? When will this trial be over? Or, we can erase all of the excess and get down to the essential: Whom do I trust? He is faithful. He is gracious and compassionate. He is able, strong and mighty and oh so merciful. He is our Provider and our Shepherd. He is Love. He is our perfect Father. We can rest in Him.